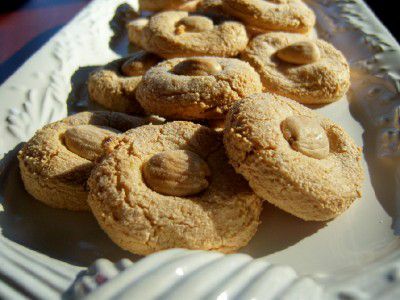 Amaretti cookies are crunchy small Italian cookies with a lovely almond flavor. They are an ideal gluten-free cookie because the recipe is free of flour. Almond paste is the foundation of this recipe- be sure to use gluten-free almond paste, some brands contain gluten as a thickener. This recipe is adapted from the recipe on the label of Solo brand Pure Almond Paste - Mrs. K's Famous Almond Macaroons. Preheat oven to 325 F / 163 C.
Line 2 large baking sheets with parchment paper or a silicone pad. Place almond paste in a food processor and pulse 3 times to break up the almond paste. Add sugar and pulse until combined. Add egg whites and extract (optional) and pulse until the mixture is combined. Make 1-inch balls from the sticky cookie dough and place about 2-inches apart on lined baking sheets. Dip fingers in extra sugar and press the cookies into 2-inch rounds. Place a Marcona almond in the middle of each cookie. Bake in preheated oven for 18-20 minutes, until firm and just lightly browned. Turn off the oven and leave the cookies in the oven for another 5 minutes for a crunchy cookie. (Note: turn off oven and leave cookies in for about 20 minutes for a real firm and crunchy cookie). Tip: ​To make homemade superfine sugar, place sugar in a clean coffee bean grinder and pulse 3 times.